Calgary city council voted 13 to 1 Tuesday afternoon to restart talks with the Calgary Flames about a new arena in Victoria Park. City council voted 13 to 1 Tuesday afternoon to restart talks with the Calgary Flames about a new arena in Victoria Park. Negotiations between the two parties collapsed last year after Flames' CEO Ken King said the city's offer to share costs was short of what the team needed. But on Friday, a council committee passed a motion recommending council resume talks on a new building, which would be part of a larger plan to create an entertainment district in east Victoria Park. Coun. Druh Farrell was the only council member to vote against resuming talks, saying she's not sure if there's any point. "It was called a partnership, but the city was expected to take the risk and not share in the reward. To me, a partnership means sharing the risk and reward, and so I haven't seen any indication that this would be any different," she said. King, executive director of the Calgary Sports and Entertainment Corporation (the Flames' parent company), said he has no comment other than he looks forward to hearing from the city. Earlier this year, King had said he'd be open to talks if the city's offer changed from what the Flames owners rejected last year. He also asked for a media blackout as a caveat for resuming talks. Coun. Jeff Davison, who is chair of the events centre assessment committee, said the request will go to the corporation soon. 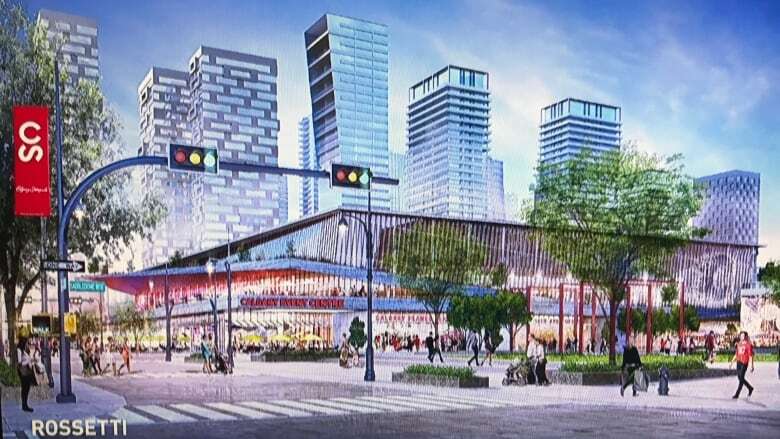 Davison said that through work with the Calgary Municipal Land Corporation and Calgary Economic Development, they've come to the conclusion that there's potential for the Victoria Park plan. "It's about moving that event centre out to the peripheral of Stampede Park … it really becomes and informs part of the community," Davison said. "It really does tie in all the puzzle pieces we have in eastern downtown." Davison said he'd like to see an events centre kickstart investment in condos, retail, hotels and other infrastructure in the area. He said the plan would be independent of whether or not Calgary decides to bid on the 2026 Olympics — but instead would focus on what would be best for Calgarians going forward. "It's not a hockey deal, this is really a land deal and it's about putting together a district. Because it's that district that we can deliver on that can provide value back to every single Calgarian." With files from Danielle Nerman, Scott Dippel.